Over 85% of the worn out tyre is reused in a retread, significantly reducing the environmental impact of mobility and giving a useful cost saving to the vehicle operator. 95% of truck tyre retreads used in the UK are made in the UK compared to fewer than 10% of new truck tyres. 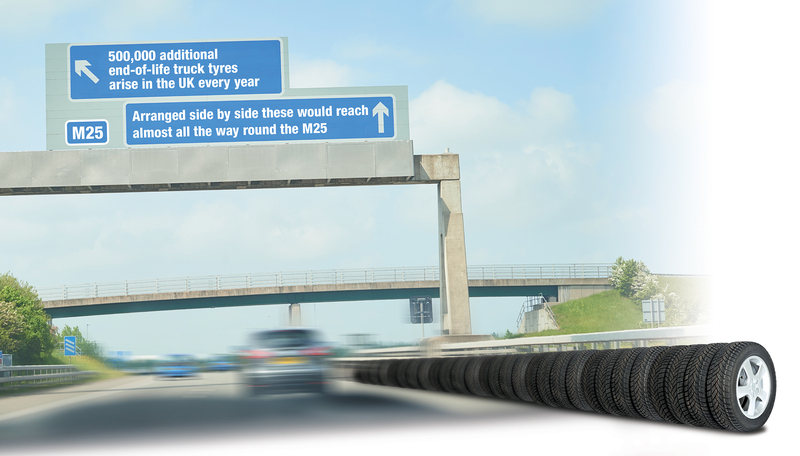 Retreading also greatly reduces the quantity of end-of-life tyres which require recovery. There is mounting public and Government awareness of the importance of increasing resource efficiency and the opportunity this represents for UK economic growth. Retreading promotes sustainable development, increases supply resilience and contributes to the UK economy through skills, employment and added value. However, in recent years the market share of retreaded truck tyres has declined by 30% under the assault of single-life throw-away tyres imported from Asia at dumping prices. Retreading will grow in strategic significance as resource efficiency gains importance in national policy. The present UK capability, both human and material, has the potential to make an increasing contribution in the long term. In the meantime, Government must defend a truly level playing field where the economic and environmental benefits of truck tyre retreading can be fairly pitted against the whole life costs and adverse environmental impact of single-life tyres. Premium retreading is a hi-tech industry employing sophisticated plant and highly-skilled workers. Retreads offer a similar life expectancy to the original tyre with significant environmental benefits. Over 85% of the returned tyre casing is reused in the retreaded tyre. Each time a truck tyre is retreaded 30kg of rubber, up to 20kg of steel and 60 kg of CO2 are saved. Many premium quality truck tyres can be retreaded more than once, offering a total life expectancy of over 375,000 miles – 15 times round the world! However, not all tyres have the necessary durability and are unsuitable for retreading due to their design, materials or manufacturing quality. This is the case for many low-cost single-life tyres. Their life expectancy typically does not exceed 80,000 miles. A truck fleet deploying a tyre policy based on premium tyres and retreading uses less than a quarter as many tyres compared to one using single-life throw-away tyres. Government has acknowledged the damage done by waste crime to the exchequer, the environment and legitimate business. A recent study for the Environmental Services Association Education Trust estimated the economic impact of waste crime in England alone in 2015 was at least £604 million. We welcome recent proposals to reduce waste crime and create a more level playing field for legitimate waste operators. Government must urgently implement regulatory change to prevent further abuse of the environment and to enable responsible business to support improved resource efficiency. Government has recently expressed strong commitment to clean growth, improved environmental protection and the doubling of resource productivity. However, at the same time, Government is defending a future trade defence policy based on solely economic criteria. Government must urgently reconcile this inconsistency. Business cannot invest in delivering the better future targeted by Government while such uncertainty remains. Tyre manufacture is a global business and BTMA members are committed to the principles of free trade. However, Government must adopt remedies for international trade disputes that enshrine a holistic approach consistent with the development of a more circular economy. We are not seeking a sweetheart deal but rather a truly level playing field where the economic and environmental benefits of truck tyre retreading can be fairly pitted against the whole life costs and environmental impact of single-life tyres.